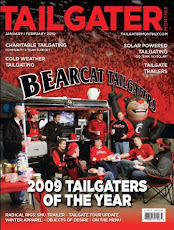 Join the Bearcat Tailgate Crew and fellow Bearcat Alums in the MILLETT HALL LOT for the Ultimate Bearcat Tailgate. We have worked with the Alumni Assoc. to make this lot the head quarters for all Bearcat Tailgaters to unite. We are taking the trailer on the road so we will have ice cold Hudy on tap and College Gameday on the TV. Look for the 25Ft. inflatable Bearcat. Parking is $5 and is first come first serve. We plan on setting up around 8:30am. Please note the fine folks at the Alumni Center did the research on the lot and they asked us to spread the word. We hope to see you there!! Go Bearcats and stop back for more details later in the week. 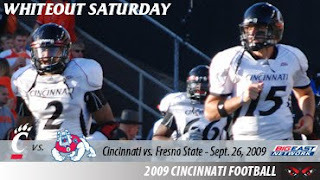 The White Out was a huge success as the Bearcats held off the Bulldogs of Fresno St. 28 - 20. Great to have the Student's Back on campus!! Join the Bearcat Tailgate Crew this Saturday before the big game. 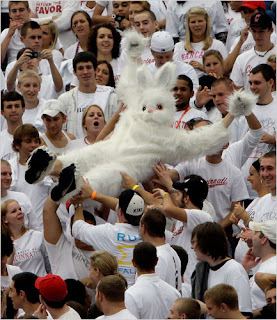 The Bearcat Tailgate crew will start scramblin' eggs and tappin' kegs at 8am so get there bright and early. This week's game is a WHITE OUT...so don't forget to wear WHITE! The tailgate crew will be serving up the best breakfast bites, our famous bloody mary's, mimosa's and back by popular demand....Bearcat Bombs! Everyone welcome donations appreciated! In the words of Flava Flav, Yeeeeeeaaaaaahhhh Boyeeeee! The Bearcats loaded up the wagon and hopped on the trail to Oregon and luckily BK and the boys arrived dysentery free just in time to lay a smack down on the RoBros and the rest of the Oregon State Beavers. What a great win for the Bearcats who are starting to show the nation that the guard has changed in the Big East and THEY are the program to beat, the program with swagger, the program that has opposing teams quivering as they take the field. So, what did we learn about the team this weak? 1) The UC defense is the real deal - This defensive unit plays fast, hits hard and the D-Line may end up being every bit as good as last year's. The scary thing is these guys will only get better as the season goes on. Late in the week we learned of Curtis Young's injury and what happens? Redshirt freshman Walter Stewart comes in and records 2.5 sacks! I originally believed the "next man in" philosophy to be a little on the cheesy side, but boy these guys have bought in. 2) This team can handle adversity - The CATS opened up with a lousy first quarter, so what do they do? Post up 21 in the second quarter to take a 21-8 lead into halftime. TP and company looked to be shaking off a few early cob webs but the defense held Jaquizz Rodgers and the Beavers to two fields goals and the offense found their groove and did what they needed to do to win the game. 3) DJ Woods is a player - Who am I kidding? This whole receiving corps is STACKED and none of them are going anywhere anytime soon except for Mardy (insert Vidal Hazleton next year). 4) TP to Mardy witta D = unstoppable - Word is, Mardy wasn't 100% but managed to still snag 9 balls and find the endzone. 5) BK refuses to run the ball even in short yardage situations - this is my ONLY criticism from this game as I believe they could have put 42 on the board had they played more conservative in short yardage situations and played for the first down rather than continue to go for the home run. They have 2 very capable running backs, they are playing with a lead in a hostile environment and Oregon State did a good job defending the short stuff all day.... On 2nd and 2, Dr. NeumannKy prescribes a quick pitch to The Human StamPEAD...then go for the home run on 1st down! 6) We don't have a punter - We're just going to have to score on every possession. This Saturday we've got the Fresno State Bulldogs coming to the Nip! They are 1-2 with losses to #10 Boise St. and Wisconsin. This team is not afraid to play anyone and lucky for the CATS they are not afraid to relax on defense. Before Oregon State, I would have been concerned about Fresno's rushing attack but now, I think this one is over by halftime. The NeumannKy predicts Bearcats 45 Fresno St. 17. Make sure to join the Bearcat Tailgate Crew in the Schiel School lot starting bright and early at 8 a.m. for Kegs & Eggs complete with ice cold hudy pops, mimosas, bloody marys and new and improved Bearcat Bombs! You are not going to want to miss this! And remember - WEAR WHITE! Another great Tailgate! Can't wait for the Fresno St. game. Details to follow! Coach Kelly continues to remind the UC Football Community that we need indoor facilities to allow our football program to win Big East Championships consistently. Click the link below to find out more information about this critical project and to donate. Let's keep Brian Kelly and his staff here by giving them the facilities they need. No Mo for SEMO. Bearcats Offense Explodes, Defense Stifles! Ok Cats Chat fans, The NeumannKy left promises unfulfilled after the step child like Bearcat beat down of the Scarlet Knights. I was actually out of town on a golf trip with some of the other Bearcat Tailgaters...needless to say, we jumped all over the celebration train after the big win and missed our early tee time on Tuesday...I know, life is rough. Enough rambling, let's talk Bearcats Football. The NeumannKy boldly predicted to start the season that the CATS would NOT repeat as Big East champs...boy you guys are suckers if you really believed me. How can an undefeated team lose their conference? They can't! Boo ya! After 2 games, what do we know about the offense? We know that they can FLAT OUT score more than Kobe Bryant in a Colorado resort & spa. Can anything other than a Bearcat blow out stop the TP to Mardy with a D connection? The NeumannKy would answer a resounding "NO"! Two games in and they're averaging 58.5 pts a game while giving up 9. While most teams around the country are using these warm up games against inferior nonconference opponents to warm their teams up for conference play, the Bearcats are lining up 5 wide on first and goal from the 6 and letting it rip! They find themselves already having jumped into the BE driver's seat with a HUGE road win against preseason darling, Rutgers. Have they peaked too early? Wouldn't it be scary if they only continued to get better? The Bearcats have so many explosive weapons in Tony, Mardy, Armon Binns, Ramsey (who looks much improved), Pead and DJ Woods, not to mention an O-line anchored by 2 of the best lineman in the conference, Kelce and Linkenbach. I'm interested in seeing how the team will respond to a good pass rush or an early deficit. Afer 2 games what do we know about the defense? To be honest, not much. We know that they gave up a 10 minute drive in Rutgers first possession, then the CATS pushed a double digit lead to take Rutgers out of their game plan for the remainder of the game. Let's be honest, they played an inexperienced quarterback who hadn't been able to get a feel for the offense and his receiving corps that's missing two draft picks in Tiquan Underwood and Kenny Britt. We do know that SEMO was way way over matched and didn't pose much of a threat to the UC defense. The good news is, they look extremely fast and well prepared. What we come to expect from a Brian Kelly coached team. Big tests lie ahead against the ground attacks of Oregon State, WVU and Pitt. None of which I believe have the fire power to score enough points to beat the air assault of the Bearcats. Next up, Oregon State. The NeumannKy says BRING IT ON. This is a statement game for the Bearcats and the conference they represent. I have no doubt that the CATS will be ready for the challenge. The Bearcats will carry the flag out west and bring back a top 15 ranking! You do not want to miss the first Tailgate of the season. The Bearcat Tailgate Crew has stepped it up a notch this year as the Bearcats make a run for another Big East Championship. Kick-off is at 7:30pm at the "Nipp" and the Ultimate Tailgate Trailer will be set-up by 3:00PM. We will be in the same great spot on the corner of Short Vine and W. Daniels across the street from the Sigma Sigma House and Daniels pub. Come Early, Be Loud, and Wear Black. As always everyone is welcome (must be 21 to drink)and donations are appreciated to off-set our costs. You must be 21 to consume alcohol at the Tailgate. Please drink responsibly. Wow what a way to start the season!!! Rutgers, picked by many to win the conference, blows the golden opportunity to snake one from the defending champs on thier home turf. The NeumannKy has a few questions...Did anyone for UC have a bad game??? Did we find anything out about the UC defense? Can anyone stop the UC offense? All the pundits had Rutgers winning the Big East...do they think that now? How many points would the Bearcats have scored if they would have kept in T-Peezy and company? Find out the answers to all of these questions plus EVEN MORE tomorrow when The NeumannKy atomic drops some mutha effin' CATS CHAT on Bearcat Nation! On another note....BEARCAT TAILGATER kicks off its sophomore campaign NEXT SATURDAY at 3 PM in the Schiel school lot. Same great space, EVEN BETTER TAILGATS! We've been working double time this offseason and have some sheeeaaaat that will blow your mind. Check back tomorrow for the full scoop.